How many times did he tell me he was praying for me? A zillion it seems. I believed him. I knew he prayed for me. One of my first memories as a child is my dad kneeling beside my bed early in the morning. While it was still dark outside and I was tucked under the covers, my dad was dressed and ready for work. One of his last habits of the morning was to lay his hand on me and pray before leaving the house. I found comfort in that as an adult, remembering how my dad loved me enough to consistently pray for me. He believed he stored prayers in heaven, and Revelation 5:8 and 8:4 say the prayers of the saints are stored in golden vessels in Heaven. And so my dad prayed much. His prayer ministry was known by those in his circle of influence. He was a disciplined man in his commitment to kneel before the throne of grace and call out multiple names day after day. After his death, I had stacks of papers, listing prayer requests people had given him. He kept them in orderly piles near a chair in the basement of his home, a chair where he knelt at least twice every day while he was able. 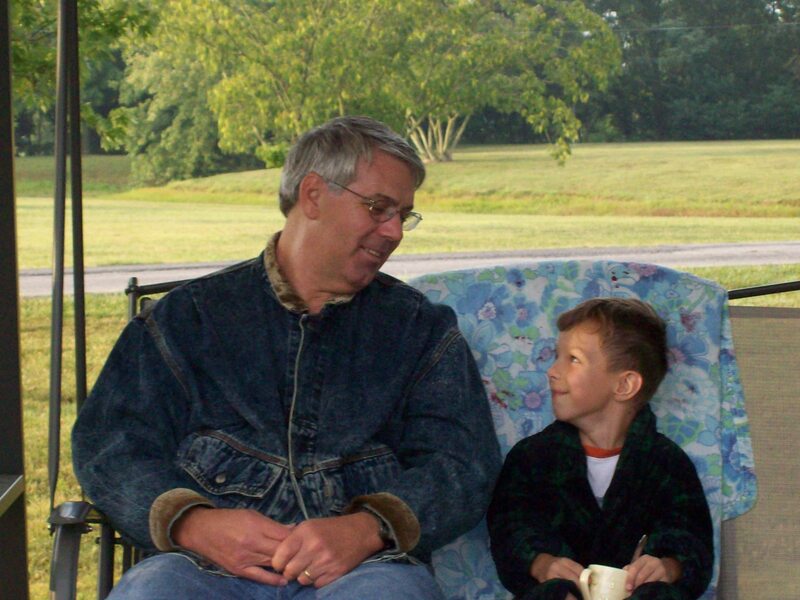 Sweet William and I talk about my dad often, the way he loved his coffee and how he slurped it loudly showing his pleasure in it. He dispensed kindness and encouraging words regularly. He could tell a great story and it got even bigger and better when he had an audience. And if he got the joke on you, it was his delight. He laughed with everything in him, his mouth wide open, sometimes slapping his knee from pure jubilation. He loved people, especially his family, and he would go to the ends of his earth to take care of any one of us. He was a wonderful father. He knew how to show me the Heavenly Father’s love. The foundation he laid for me as a child helped me stand when the winds of tribulation have threatened to blow me away. I knew my dad loved me. I knew he was there if I called him. I knew he prayed for me consistently. My dad is with Jesus now. 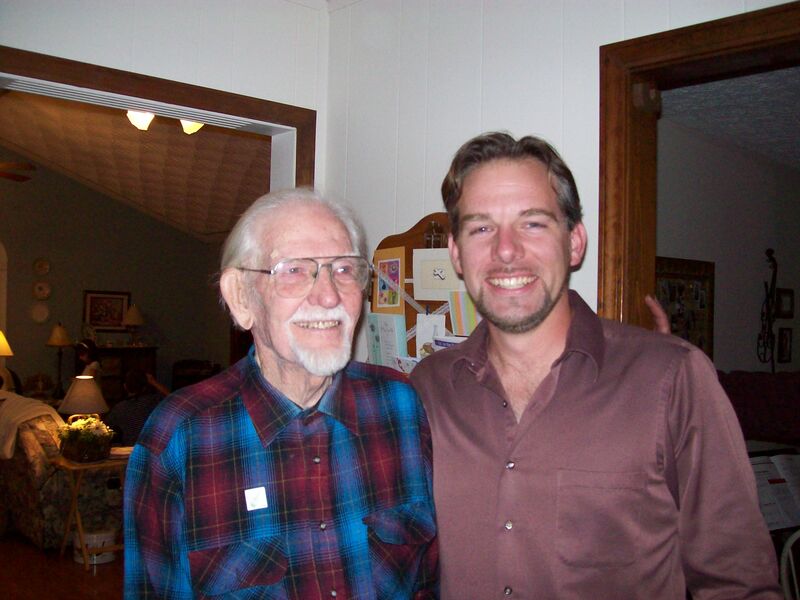 I miss him especially today, on Father’s Day. I would love to fix a plate of sausage gravy and biscuits for him and hear him say, as he always did, that it was the best I’d ever made. I’d like to hear the army stories he told until I had memorized them. I’d like to hear him laugh one more time. I’d like to hear him pray for me once more. I believe his prayers are still alive, kept in heavenly golden containers, and there is a large one with my name on it. Those stored prayers still come before God’s throne, intercessions on my behalf. A good and godly father is a treasure above wealth this world can give. I am a rich woman because of it. Dear Father and God of all, thank you for the men in my life who showed me Your love, who were strong and protective, who loved purely and acted faithfully. Dear Father of all creation, give grace to the fathers you have put on the earth and in our lives. Give them tender hearts and strong faith. Help them see their need for You and not live as if they can do it all by themselves. Dear Father of humanity, give endurance to the fathers who walk hard roads, who fight battles for their families, who bow low in prayer and intercede for loved ones. Dear Father of light, shine your saving light into the hearts of fathers. May they know salvation through Jesus Christ and bear His fruit in their lives. Dear Father of mercy, show the fathers how to live compassionately, how to forgive and ask for forgiveness. Help them to hold their tongues and tempers and let love be the language of their lives. Dear Father and fount of all blessings, let your grace fall lavishly on the fathers. Their task is great and they need you. To the fathers who run along side kids on bikes without training wheels, who shout encouragement, and then keep on encouraging with each new challenge. To the fathers on Father’s Day and every day. We need you to be strong. We need you to be faithful. We need you to be men. We need you to show us our Heavenly Father. To the fathers. We need you to be strong. We need you to be men. We need you to show us God the Father. On this Father’s Day, I pray God’s blessings. Grace, mercy and peace to all of you from God the Father and from His Son, Jesus Christ. It took me a while to understand and to appreciate the fact that men are not like women. If I had known it when I first married Sweet William, I think it would have made both of our lives easier. But I love it that they are different. As I think of Father’s Day and the men in my life, I am thankful. So many have left their mark on me, have changed my life for the better, have shown me the face of God. There are the pastor and choir director who encouraged this shy young musician to use her gifts in spite of her fear. There is the uncle who gave me money to help buy my first car and sent me on a trip to New York City free of charge. There are the ministers who preach the Word that cut like a sword and healed the wound and helped me grow. There are the deacons who take their role seriously, who visit the sick and shepherd the flock. There are the teachers who challenge me to think deeply, to question what I believe, and help me confirm what “thus saith the Lord” really means. Men are focused. I love it that they can stay on one task and not veer off until it is complete, unlike me whose brain scatters from one thing to another to another until I wonder how anything gets accomplished. Men are protective. I remember when my very young grandson, Ethan, was pretending to be in a battle. He looked at me standing there at the kitchen sink and said, “Don’t worry. I’ll save you.” His DNA is infused with a warrior spirit to fight for and take care of those he loves. Men are courageous. It isn’t that they are unafraid. It is that they are willing to go check on that noise in the dark or to tread foreign soil for freedom’s sake. Men are tender. I’ve seen them cry over a sad movie, trying to hide their sniffles. The tough exterior is just a covering for a soft heart where gentleness resides. Men are strong. They exert their strength to lift heavy loads, to trudge off to work every day, to go the extra mile, to be there for their friends and families. I come from a long line of good men. My grandfather Charles Lockard was a minister of the gospel who paved the way for me disregarding the persecution. Yet he was one of the gentlest souls I ever knew. My dad, John Rayhill, is a man who knows how to take care of the women in his life. He prides himself that he never let my mother take out the garbage. That was his job. He was always busy with something but he was never too busy to stop for me or one of the neighbor kids who needed a bike tire pumped up or something repaired. My husband, Bill Wright, is my hero. He was a good provider until his health took him down. He fought for our marriage when everyone else gave up on it. He has endured so much pain and too many surgeries with courage. He still tries to look on the bright side, and he makes the effort to be kind to the hospital staff and learn their names, making him their favorite patient. My son, Travis Wright, is funny and fearless. He has an infectious joy that draws people to him. He has been my Son of Consolation through many tough years. He is a faithful husband and a playful dad. He bravely left his hometown and moved his family to Oklahoma to pursue his dream (though I have not yet gotten over it). I honor the men who stand for God, who take care of their families, who protect their children, who are determined to do the right thing even when it is hard. Men who go to war so I can be safe, who fight fires and keep the peace. Men who lead with courage and care. Men who put their lives in harm’s way for the sake of others. Thank God for fathers who show their boys how to be good men, who treasure their daughters and teach them how a man should treat a woman. Thank God for fathers who love their wives and stick it out when it would seem easier to walk away. Thank God for fathers who love and care for other men’s children who have walked away. Thank God for fathers who discipline with love instead of anger, who set a high standard of living so that their children have a role model worthy of following. Thank God for fathers who get on their knees and pray every day, who take their children to church instead of just send them. Thank God for fathers who go to work, for fathers who know how to play, for fathers who teach right from wrong and walk their talk. 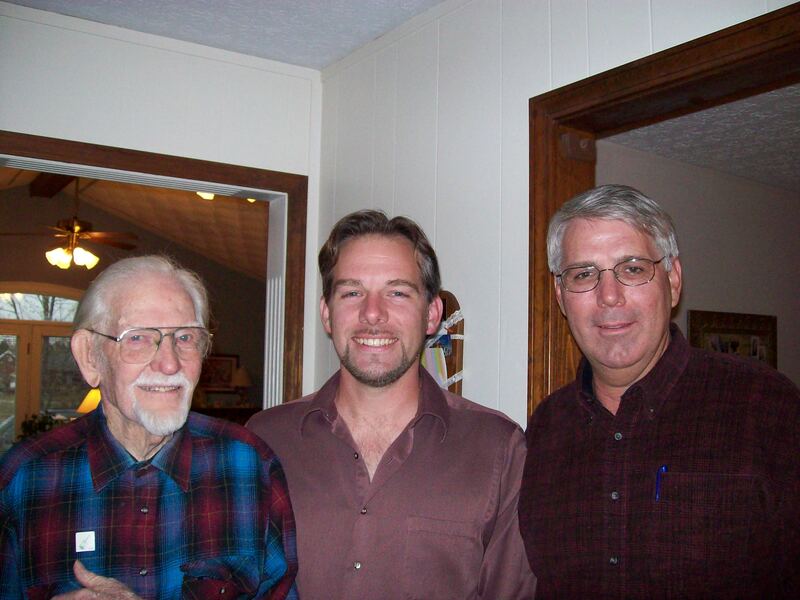 I love those men in my life: my precious going-on-91 Dad, my Sweet William, my son of consolation Travis. And there is still one more, our little man, Ethan, 10 years old. He is watching these good men, listening to their words. He will be influnced by their lives. May he follow their footsteps. My dad called and said he was ready to let go of a couple of items, and he thought I might want them. One is an embroidered picture my mother made as a Christmas present for him in the 1980s. It says, “Life is fragile. Handle with prayer.” It was an appropriate gift for my dad who has been a prayer warrior for years. His prayer life is an example of what it means to “Carry one another’s burdens; in this way you will fulfill the law of Christ,” (Galatians 6:2). The framed embroidered verse had been hanging over a chair in the basement of his and Esther’s home for the past 25 years. The other item was the chair over which it hung. And that surprised me. The chair came from a branch of the First National Bank in a downtown location when I was in my teens. The bank was being remodeled by the company where dad worked. Whenever there was a remodel job and stuff was being thrown out for the newer and more updated, Dad would ask if he could salvage some of it. He brought home many a piece of so-called junk and found a use for it. The chair was such a piece and in decent shape, so he brought it home and put it in his workshop behind our house on Arnoldtown Road. It became his prayer altar. Dad went to his shop each evening and had his nightly prayer time. It was as regular as the sun setting. He did not miss an evening. God was calling him to a prayer ministry, and he did not waver from his commitment. The chair traveled to Shepherdsville in the late 1960s when we moved. Dad built another house and workshop. And the chair was placed in the rear of the shop where he prayed regularly. Dad’s prayer ministry became well-known and quite eventful over the years. People often came to the house asking for counsel and prayer. Many times Dad took them to the garage where the person knelt at the chair. I had my own personal “praying through” experiences at that chair. I recall weeping there, pouring out my heart, and being aware of the presence of the Almighty. 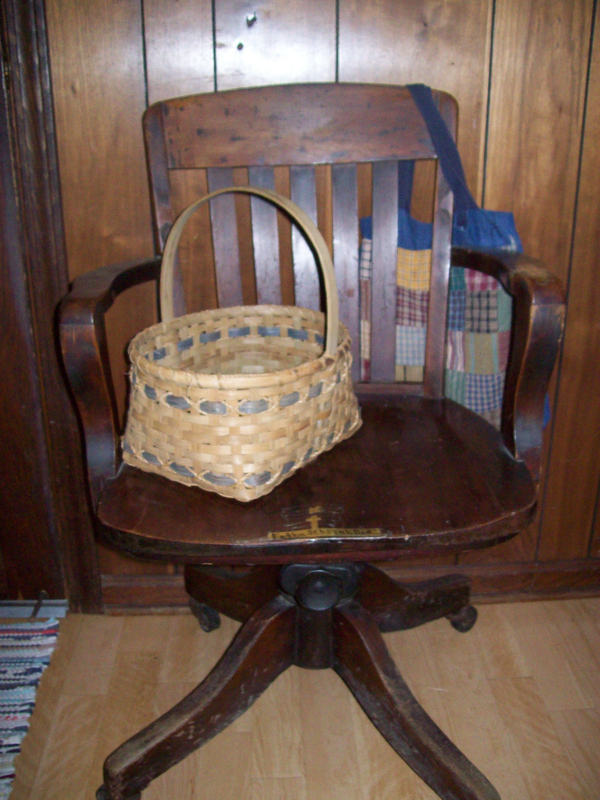 When Dad remarried after my mother’s death, he took his chair and placed it in the basement of his and Esther’s home. And the people came there for prayer. At that chair my dad gathered thousands of prayer requests people gave him over the years. 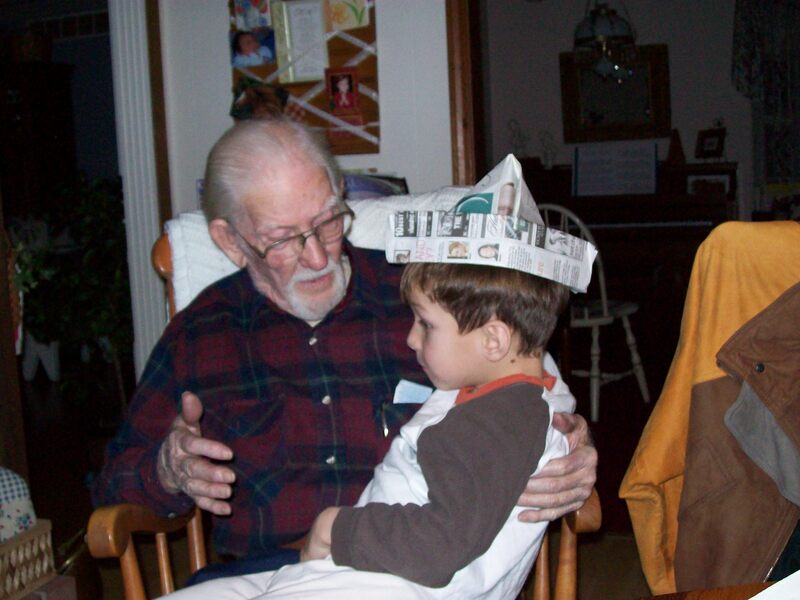 Stacks of letters in envelopes, slips of paper, pictures of children and loved ones filled the area surrounding the chair that sat in the corner of his basement study with Mother’s embroidered artwork hanging above. My dad knelt at that chair, too many times to count, calling out my name, Sweet William’s name, the names of my son and daughter-in-love, the names of the grandchildren, our familys’ names and names of people far and near. Dad loves to recount Revelations 5:8* explaining that there are containers in Heaven holding the prayers of the saints. He declares that he has filled a lot of those containers on behalf of those he loves and holds dear. The chair became a sanctuary where dad met with God daily. So it shocked me when dad asked if I wanted the chair now. I didn’t expect it to leave the house until dad left this earth and was in the presence of God. Dad explained that when he and Esther experienced the house fire in 2009, his prayer routine changed out of necessity while the house was being reconstructed. During the six months when he could not go to his basement office, he changed his prayer habit from the chair to another place. Now back in their house, he has arranged the many requests he receives at another altar so he can put his hands on them and pray over them each day. Bill and I went to get the chair and the picture. There in the basement I moved things out of the way to bring the chair into the center of the room. It was a holy moment for me. Memories flooded and my thoughts swirled. The presence of the Lord seemed to hover near. It’s not that the chair is of itself holy or some sort of talisman. But it does represent a man meeting with his God. A simple man, a sinner saved by grace, a life that was changed to become the image-bearer of Christ. The influence of his prayers will be told in eternity. Christ who ever lives to intercede for His children called this man, my father, to a prayer ministry. And he has been faithful to it. The chair is in my home now, sitting in my kitchen. I don’t really want anyone to casually sit in it. It’s not that kind of casual chair. It’s my dad’s prayer chair, the altar where he wept and prayed for many people over the years. Since relocating it to my home, I’ve knelt at the chair and I expect I will again. The chair is a place where my dad met with God and where God met with my dad. It represents dad’s legacy, more valuable than any monetary inheritance he will leave me. Dad’s prayers follow me. I am strengthened by them. God hears my name often throughout the day because my dad prays for me. I want to leave a legacy for my children and my children’s children by becoming a woman of prayer, by believing God’s promises, and by being faithful to pray without ceasing. I have a way to go. At least I am on the journey. *Revelations 5:8 – And when he had taken the book, the four beasts and four and twenty elders fell down before the Lamb, having every one of them harps, and golden vials full of odours, which are the prayers of saints. How has prayer affected your life? Who prayed for you? Leave your memories here.